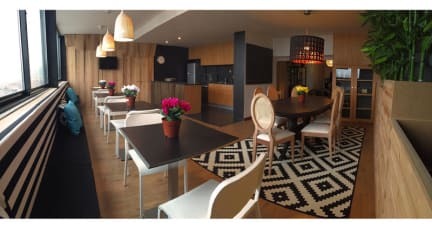 JustGo Hostel Braga i Braga, Portugal: Reservér nu! Braga, besides being awarded as European Youth Capital in 2012, has also an unique richness in cultural and historical terms. Here you can find the oldest cathedral in Portugal, Sé de Braga. JustGo is centrally located at the main avenue of Braga and in the surroundings you will find restaurants, bars, markets and also cultural facilities. The Hostel combines the urbanistic character of the city with an attractive and cosy modern design. Our Dorms were thought regarding your privacy and well-being. Therefore, you will find in each bed a reading light and a curtain. The Twin rooms have private bathroom and an LCD TV. Also, there’s a balcony in the Deluxe Twin rooms with a panoramic view of the city.You will find a panoramic view as soon as you get in our meal area. You can cook your meals in our modern furniture and while you are eating you may look at two of the most iconic monuments in Braga, Sameiro e Bom Jesus.Sounds too good to be true? It’s actually that good! In our lounge room there’s a small library, a PC for your own use, a LCD TV and a WC. Our lounge is so comfortable, that we’ve decided to input the reception nearby it so we can enjoy a piece of that harmony too. Our Wi-Fi is free and has an optimal signal throughout the Hostel.